The Grant Inception to Date form FRIGITD captures expenditures on an award. This form can either include all expenditures since inception or for a specific time period. The Banner G# captures the complete financial status of an award so viewing at the index or fund level may not give you the complete financial status. To view at fund level, select ‘Fund Summary’. To view by agency categories, select ‘By Sponsor Account’. The Deferred Grant Process FRRGRNT is run weekly and at month-end to calculate applicable IDC, populate the Banner billing tables, recognize revenue and record an Unbilled Accounts Receivable. SPA must follow the agency’s requirements concerning deadlines for submittal of final LOC draws, invoices and financial reports. The Report of Final Expenses (RFE) form is used by departments to report final expenses on sponsored awards and should include all allowable expenses, even if they are not yet posted in Banner. SPA must receive the RFE with adequate time to review all expenses prior to the invoice deadline. Thus, the RFE is due to SPA halfway between the award end date and the invoice due date. 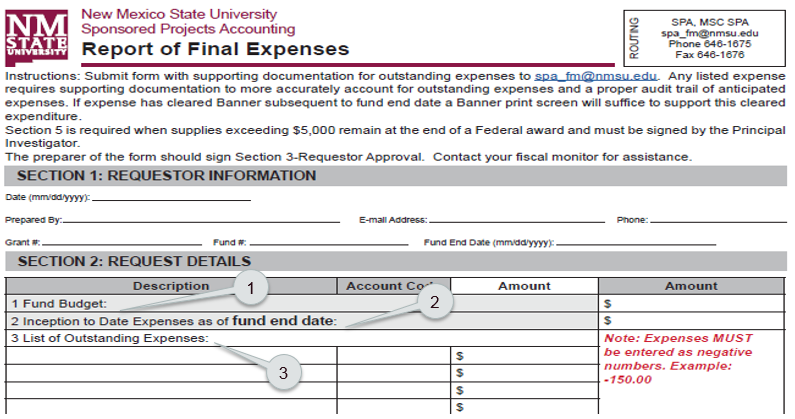 For example, if an award ends June 30 and the final invoice is due July 30, the RFE is due to SPA by July 15. For final invoices due on or before the award end date, RFE is due to SPA 7 days before the invoice due date. For example, if the final invoice is due June 30, the RFE is due to SPA by June 23. Fund Budget: List the total awarded budget for the fund. A separate RFE is required for each fund, including cost share funds. Inception to Date (ITD) Expenses: Must be as of the end of a CLOSED month. For example, if the RFE is completed prior to June FINAL close, you must use May final close figures. List of Outstanding Expenses: Include ALL expenses not in the ITD amount. ALL listed expenses require backup documentation. Expenses already posted to Banner only require a screenshot as backup documentation. Expenses not in Banner require copies of the actual expense, i.e. Direct Pay Request, Reimbursement Voucher, PCard receipt, etc. Labor must be broken down by employee and pay period. 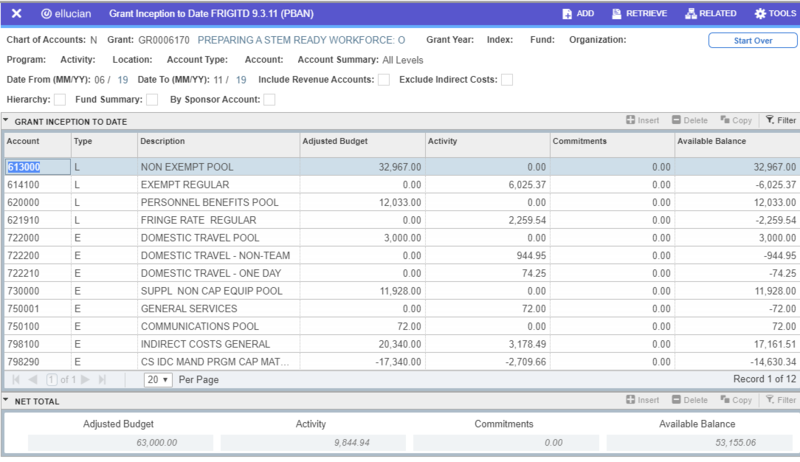 Add a separate line for calculated IDC only for expenses that generate IDC. Per the UG, “If there is a residual inventory of unused supplies exceeding $5,000 in total aggregate value upon termination or completion of the project or program and the supplies are not needed for any other Federal award, the non-Federal entity must retain the supplies for use on other activities or sell them, but must, in either case, compensate the Federal government for its share.” If the estimated Fair Market Value is less than $5,000, title rests in the grantee and no inventory is necessary. To meet this requirement, the RFE includes Section 5 to list the unused supplies and state if they will be used or returned to the agency. The PI has a fiduciary responsibility to utilize the residual inventory under the First In First Out (FIFO) inventory method and must approve this section of the RFE. The State of New Mexico and a few other agencies have a quicker than normal turnaround time for final invoices. Departments should be prepared to submit an RFE to SPA in a timely manner to ensure that all allowable expenses are billed by the final invoice due date. Without an RFE and sufficient backup documentation of pending charges, SPA will invoice the agency based on Banner amounts.